There are a few people named Kish in the bible, but for the purpose of this post I will be referring only to Kish, the father of Saul. The bible is filled with genealogies, even though the bible explicitly forbids reading genealogies. It should come as no surprise, then, that every once in a while the bible mixes up paternity test results. This appears to be the case with Kish. Who is his father? In 1 Samuel 9:1 we discover that Kish came from Abiel’s seed. Then we flip to 1 Chronicles 8:33 and find that Kish’s father is Ner. Some have tried to explain this contradiction by claiming Ner is actually Kish’s brother, which is supported by 1 Chronicles 9:36. But this creates a new contradiction because 1 Chronicles 8:33 clearly states Ner is Kish’s father. So either we have a contradiction about who Kish’s father is, or we have a contradiction about who Ner is. Actually, the truth is we have both. This entry was posted in Atheism, Bible Contradictions and tagged Atheism, atheist, atheists, bible, Bible Contradictions, Christianity, Christians, contradictions in the bible, God, Religion, the bible. Bookmark the permalink. 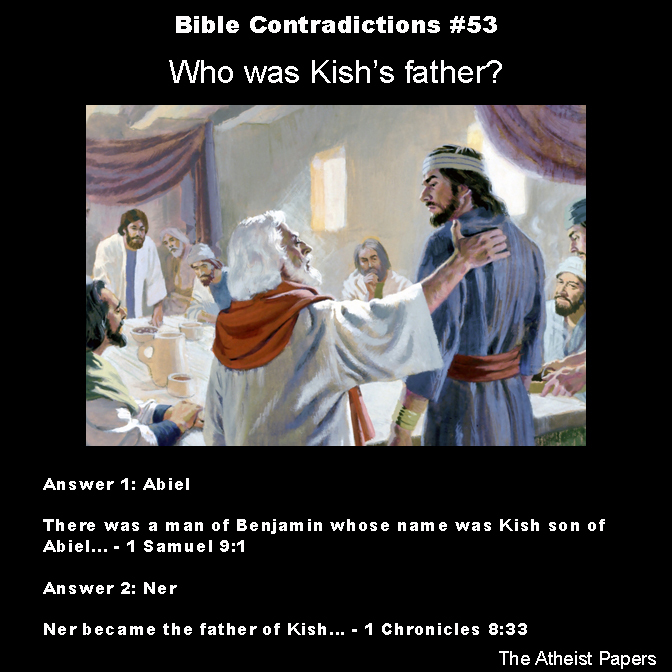 3 Responses to Bible Contradictions #53: Who was Kish’s father? Maybe something happened to Abiel and Ner stepped in to do the right thing and “became” Kish’s father. Another possible explanation is that the phrase ‘son of’ might mean ‘descendant of’ – but I’d have to check the Hebrew idioms used here. Still, it would seem a document inspired by god should avoid such problems.